We all had fun at Joy's 80th Birthday in Napier this past month. All the kids turned up. Bernard gave a very nice talk, including about how he met mom, and the Facebook community marvelled afterwards at how young she looks! Joy, Elizabeth and Josephine, Alexander, Bryony, and even Robyn gave us some fabulous musical performances. At this rate I think a 90th Birthday is an easy prediction! We have some photos up in the gallery here. Back in the 70s when Linda and I were kids running around the corridors of the Max Plank Institute waiting for dad to finish work, one of the attractions we'd stop and goggle at were glass display cases containing hand made models of satellites and various space-related gadgets, relating to actual space research projects that the Institute was involved in. 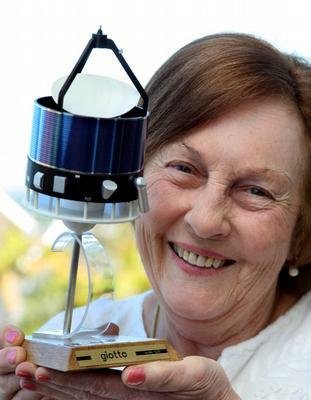 Joy has now obtained one of these models, the Giotto space probe. It is to become the annual award for academic achievement in Year 13 physics at Napier Boy's High School, where dad himself went to school. Read the full story here. Photo by Duncan Brown, Hawke's Bay Tribune. My father passed away on Saturday 13 March 2010 in Napier after a long illness. We had a private funeral at Wharerangi Lawn Cemetery. There have been plenty of obituaries and articles published during the week and as they already contain good information, I'll simply link to some of them here. I'd like to thank all those who have gone out of their way to write and publish these items. I will have some photographs and other information posted on this website after the memorial service. Ian's email account will remain active as long as it receives email, but for any enquiries, please contact Joy or one of the kids. Dad's cricket stats - Who knew? My friend Ian Hopkins took his life recently after an extended battle with depression. I spent a long night before his funeral looking through old films and produced a brief photo story as a tribute. I've made it available here for friends and family to download and view. A copy has been placed on YouTube for immediate viewing below. It is often best on YouTube to pause playback at the beginning and let it load for a minute or so, in order to avoid unwanted stops and starts. The music used includes a song titled Greenfields; written and performed by Luke Hurley and recorded as the title track of an audio tape that Ian and I produced for the "Fun & Frets" tour we staged in the early 90s featuring Luke, Dave Murphy and Alex Staines. Ian and I listened to Greenfields over and over again on our travels, wearing out more than one unsold copy of the tape. All of the photos but one were taken by me over many years. The section where Greenfields begins takes place at Autumn Farm in Golden Bay. We were both at crossroads in our lives... a place Dave just happened to be singing about on the flipside of the same tape. The new header graphic for this site shows the location of asteroid Axford and nearby planets on Ian's birthday in 1933. I lifted information from the t-shirt made by Paul and displayed here. He traced the image in Autocad off a fax sent by Asoka. I combined it in Xara and Photoshop with data taken from JPL's entry on the asteroid to create the graphic. I still have my t-shirt. Who else has theirs? I've pulled several Axford-related web sites here under this one hosted on my WonderWebs system. Domains directed here include axford.org, axford-russel.com and robertaxford.com. A blog is available for each family member and photographs can be posted to the Photos page - simply ask me for access. 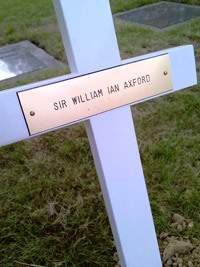 The Axford family genealogy is displayed here as well. Links to a few other family websites are here on the right as are email links for all.